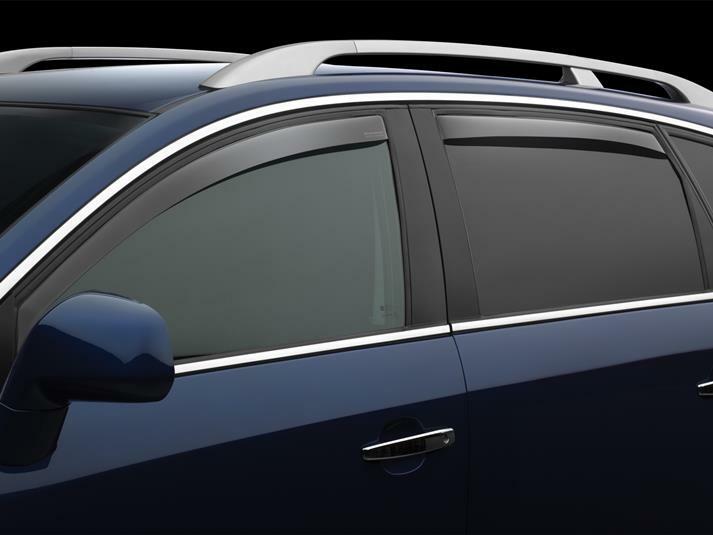 WeatherTech Side Window Deflectors are precision-machined to perfectly fit your 2004 Toyota RAV4's window channel. These low profile window deflectors help to reduce wind noise and allow interior heat to escape. Our light tinted Side Window Deflectors are the only deflectors in the world made with a D.O.T. (U.S. Department of Transportation) approved glazing material. Available in light and dark tint for most vehicles. Designed and Engineered in USA – Handcrafted in Germany. I was looking for window deflectors and came across WeatheTech on the net. The price was higher than I had paid for some of it's competitions products but liking the design and explanation of the product on the website I chose to buy a set of deflectors. I assure any of you reading this that the product I purchased Is much better than expected and I will not hesitate to purchase their products again. I also called customer service for some help and they were extremely helpful , courteous and professional with my concerns. I intend to purchase other items from them in the future. If you are looking for quality and value WeatherTech has it! I got the box. My heart was thumping hard. I read the instruction carefully. When I was ready to install the side window deflectors, my hands were shaking and sweating, too. After I installed all 4 side window deflectors in 16 minutes. Too easy and fast!!! I re-read the instruction again to be sure that I did the right thing. Yes, I did. I re-checked all 4 side window deflectors to be 100% sure that I did the right things. Yes I did. Still, I felt guilty because it was like a snap fit - made custom to fit for my RAV 4 - PERFECT fit with no hardship at all!!! I was shocked but proud of America-made products. Hail to MacNeil Automotive!!! Installed these deflectors 6 weeks ago. They work great! I am able to keep the windows open an inch or so to let the heat escape and when it rains the inside stays dry. Some people say the rear one flew off while driving. If it is installed correctly, there is no way it will fly off. I installed mine and a few hours later it dawned on me that I didn't install them correctly. I had to look at the instructions carefully to verify that. Reinstalled and all is well. Would recommend these to anyone. I like the window deflectors because the wind doesn't cause the beating and drumming sensation with the windows down like I experienced before I installed them in the front and rear windows. Also I can leave the windows down a little so that the heat from the sun can escape.